Dungannon Swifts manager Kris Lindsay pictured with his new club captain, Christopher Hegarty and vice-captain, Seanan Clucas, who have both signed contract extensions. Dungannon Swifts have confirmed Christopher Hegarty and Seanan Clucas have agreed new deals with the club. Hegarty has signed a one-year extension until 2022, while Clucas’ deal is until 2020. 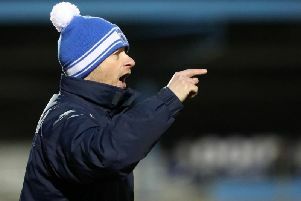 Swifts manager Kris Lindsay said: “I’m delighted to secure the future of both players at Dungannon Swifts. Chris and Seanan are excellent players with the ability, attitude and desire needed in order to push the club forward. “They are both local lads and are the type of player that we need to build the club around and that have the club at heart. I’m also pleased to announce that Chris will be the new club captain and Seanan vice captain moving forward. New club captain Christopher Hegarty said: “I’m delighted to sign an extension to my current contract. Obviously I’m even more delighted to be announced as Club Captain of Dungannon Swifts FC. Vice Captain Seanan Clucas added: “I’m very happy to have signed an extension on my contract. I’m very happy at the club and since Kris Lindsay has come in, I’ve been able to put performances in where I know I play my best football, in the middle of the park.